Born in 1934 in Ipoh, Dr. Choong Kam Kow is a prominent contemporary artist well known not only for his enchanting works, but is also a highly-respected academician as a leading art and design educationist. His works often echo the cultural components and norms of the Chinese community in Malaysia. 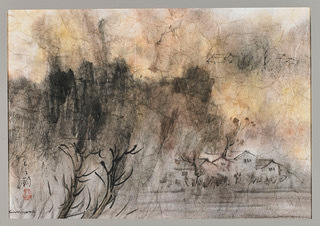 He portrays the cultural practices and values in the contemporary life of the Chinese community through the use of silkscreen techniques and acrylic colours in the form of visual symbolisms. Academic background Choong started his career as an artist and an art teacher by participating in a teacher’s training scheme and was awarded the position of a qualified primary school teacher, teaching mainly art subjects. He later spent four years in Taiwan studying western and oriental fine art and gained a BA in Fine Art from the National Taiwan Normal University in 1961. He was the first Malaysian fine artist to be awarded a Fulbright Scholarship to study in the USA at the Pratt Institute in New York where he obtained a master’s degree in Fine Art in 1968. At this time, he was also appointed as head of the Art Department of the United Nations International School in New York. In 1969, he returned to Malaysia and joined UiTM (formerly known as Institute Technology Mara) where he was known as a notable figure for his art knowledge and expertise. His academic career continued until his retirement in 1989, head of the Fine Arts Department. In 1980, he was again awarded a Fulbright Scholarship and became an ACLS-Fulbright Research Fellow until 1981. In 2006, he was conferred an honorary degree of Doctor of Arts by Robert Gordon University, Scotland for his contribution in education and achievements in fine arts. Educational legacy Being academically successful, Choong became the dean of Fine Arts at LASALLE-SIA College of the Arts in Singapore in which he played a role in revamping the structure of the school before he returned to Malaysia in 1994. This was when he dedicated his time fully to his art. His attraction towards academia did not hinder him from being the vice president of the Malaysian Institute of Art (MIA) in 1995, a position he held for five years and was appointed the president in 2000. It was during his years at MIA that he sought to enhance and develop the teaching techniques, syllabus and the administrative structure of the art subject. He fully utilised his overseas experience and knowledge to ensure that what was taught to students with regard to the arts remain fresh and current so that aspiring artists do not fall behind. From the rationale, prerequisite, description of the course, weekly syllabus, assignment assessment method, evaluation system to the assigned credits, he ensured the restructuring of all these aspects. He revamped eight departments and over 400 subjects. Choong has also been instrumental in developing international links with universities in the UK, Australia, New Zealand and China. Choong’s works of art Choong’s works are often synonymous with symbolisms. His exposure to nature and his upbringing influenced his artistic talent from a very young age and these influences are highly visible in his works. During his time in New York in the 1960’s and early 80’s, he was highly influenced by abstract expressionism, pop art, hardedge, conceptualism and international art movements. He exhibits the connection between traditional values and contemporary life, depicting the co-existence between cultural identity and modernisation. Having been brought up in a multi-racial and multi-cultural society, he was exposed to ample cultural symbols of the diversity in Malaysia and uses these elements to transform them into art symbols in his creative art pieces. His notable works include the saga of the following four series – Festival series, Rhythm of Growth series, Rockscape and Earthscape Series. These series are fused with hidden traces of Choong’s philosophic thinking and metaphoric content of cultural symbols, amalgamated with the realisation of sensuality, sensitivity, thought, imagination and distinctive artistic quality. The Kinta Series The Kinta Series comprises Choong’s range of works in the 1960’s. He described it as a “period of exploring, experiment and searching”. He channelled his inspiration from art masters such as Chen Wen Hsi, Cheong Soo Pieng and Zao Wou-Ki to produce the series, working with oil, water colour and Chinese ink via expressionistic art approach. It was a time in which he narrated a story of his childhood, depicting scenes of villages and tin mines in Perak. His choice of colours used for this series sets the nostalgic theme as he shares with his audience a part of his past memory. He brings forth a feeling of reminiscence with a gush of mystique and wonder to those who set their eyes on his pristine pieces. You can’t help but be in awe with the alluring way he strokes his brush and expresses his story with remarkable power and aesthetic impact. He successfully presents the contrasts and cohabiting between East and West, tradition and modernity as well as nature and humanity. Achievements and accolades Choong has had 18 solo exhibitions to date at various prominent venues around the world including the Fukuoka Asian Art Museum, Guangdong Museum of Art Japan, Taipei Fine Arts Museum and Taiwan Museum of Art. He has also joined nearly a hundred of other local and major exhibitions to add in his repertoire. He has won competitions such as first place in drawing and second place in watercolour at the Virginia Art Show, second place in landscape in the PNB Art Competition and third place in the Association of Banks Art Competition. Having gained international recognition, art devotees will be able to find his works in numerous art museums including the National Art Gallery Malaysia, Metropolitan Museum of Art in New York City, Fukuoka Asian Art Museum, Singapore Art Museum, Taiwan Museum of Art, Frederikshavn Museum of Art, Taipei Fine Arts Museum and Guangdong Museum of Art, and private collectors.